Well, the time has finally come for me to say goodbye to two holdings in my portfolio. When it comes to investing, I am a big fan of the “buy and hold forever” strategy. In the perfect world, I would always pick the right stocks, they would always exceed expectations, and I would never to have to sell! Sadly, reality is quite a bit more complex, and as such, most holdings require a “buy and monitor” approach. I made the decision to sell Transocean (RIG) a few months ago, realizing that the stock didn’t fit my long term strategy. 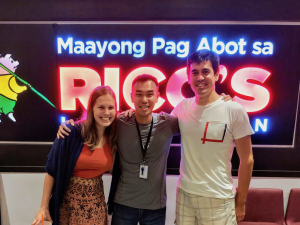 RIG was one of the first stocks I purchased early in 2012, and at the time, I was new to dividend investing, and in all honesty, I didn’t really have a concrete strategy in place. I took a gamble on RIG since it had been so severely battered by the Macondo oil spill. Looking back, it now seems that my main objective was to make a quick buck and trade this stock. RIG suspended its dividend earlier this year, but even then, it was never regarded as a dividend growth company. As a result, I’ve been investing in this company for almost a year, and it has produced exactly $0 in passive income. RIG has taken me on a rollercoaster ride, with plenty of ups and downs. I’m well past the point of feeling nauseated, so it was time to let go. Today was a good day to sell RIG, as earnings were released and the shares rose by 5.6% (at closing). I sold all 58 shares at a price of $48.35/share. Since I purchased RIG at a higher cost basis, I actually ended up selling at a lost. 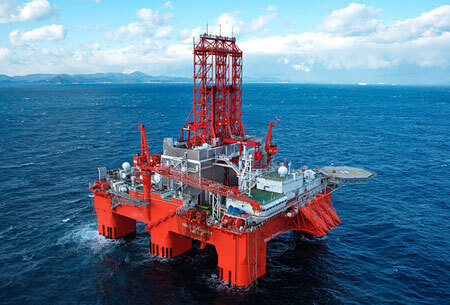 SeaDrill is another off-shore driller, but unlike RIG, it actually pays a dividend, and quite a hefty one at that! SDRL currently yields at 8.22%, and its stock price has been on fire since the start of the year, up over 20%. As such, you might be wondering, why did I decide to offload this driller as well? I’m still a fan of SDRL, but it was also one of my riskier holdings. It’s a very volatile stock, and the company is highly leveraged. Today, I sold 76 shares of SDRL for $40.82/share. I still own 0.588 shares which will be automatically sold off in the next few days. 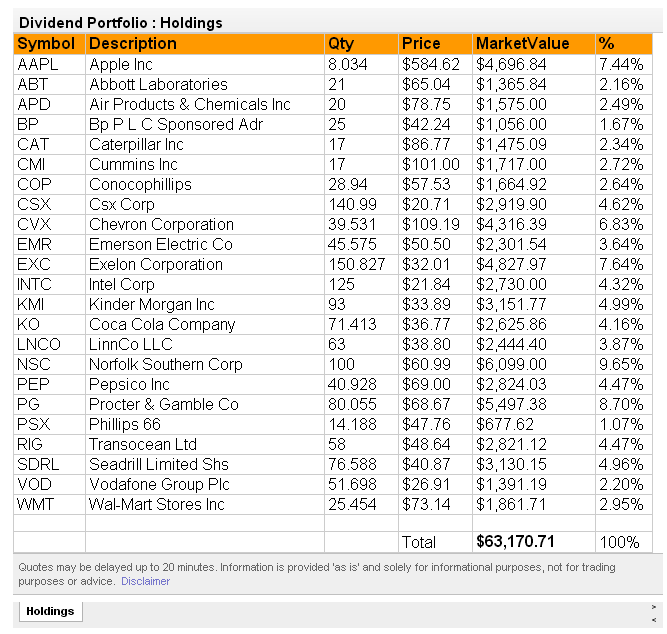 When analyzing the overall portfolio, I’ve concluded that my preference is to own more defensive holdings. I value consistent dividend growth, so it’s absolutely critical that I invest in the companies that I feel will be able to maintain their streak. I can’t really say that about SDRL, as it was definitely a stock that didn’t allow me to sleep with ease during the night. In the future, I may add this stock back into the portfolio, especially as it becomes more proven. But for now, I’m content with taking the profits off the table and reinvesting elsewhere. I wish I could say the same about one of m first purchases. Like you I figured that I could just trade it and make some quick money, after about 10 months it had eroded about $150 but the good thing is that I made the purchase when I had very limited capital so the position wasn’t anything of significance once I really got to start investing. I’m definitely leaning more towards the defensive stocks. I just wish that JNJ, PG, KO and others would come back down in price a bit so I can pick up some more shares. I wish that I had found DG investing back in late 2008 and early 2009 because that was like shooting fish in a barrel, although it took a lot of nerves to buy at that time. It’s never fun losing money, but with investing, sometimes the only way to really learn is to be burned first-hand yourself. I’m glad that your losses weren’t anything significant. In my case, I feel lucky to walk away unscathed. 2008-2009 were definitely some golden years to be purchasing stocks. I only wish I had a better understanding of the market then, so I would have had the conviction to make purchases. I was just starting out in my career, so investing wasn’t one of my top priorities. As a result, I also missed out on the blue-chips you listed. Hopefully our generation will have another crack at it sometime in the future. For those of us who are now educated in dividend growth investing, I’m convinced we’ll stick with the strategy and carry through, even when those around us panic and sell. I understand your reasons, especially with Transocean. I ended up selling some my original picks and would have been better off getting rid of another. In the beginning it was all about yield and less about dividend growth. I’m pretty sure when we have portfolios of 20-30 different stocks there will be some losers. It’s bound to happen sooner or later. I expect a certain portion of my picks won’t perform well. It’s just reality. In the future I will also be looking to invest in safer options. That’s not to say I will completely avoid riskier companies, but I plan to make them smaller positions. Yeah, it’s unfortunate not all purchases work out like we envision. But I’m reminding myself that in the end, it’s business, so I can’t allow myself to get emotionally attached to stocks. After seeing the price depressed for so long, a part of you wants to be around to see it rally and flourish. In the end, a static stock does no good, bottom line. Not only does it hold your capital stagnant, but you miss out on other good opportunities elsewhere. There are just too many other viable candidates out there for me to hold on and play the waiting game. I tried that once already, it wasn’t much fun. I like your plan of allocating only a small portion to riskier assets. Who doesn’t want to locate the next Apple before it takes off?